You can buy Epsom salt for about a dollar a pound online, making it one of the most affordable beauty and health treatments in existence. And yet, Epsom salt is one of those ingredients that remains hidden in the back of every household pantry, only to make an appearance on special occasions. Most people use Epsom salt to soothe sore muscles without thinking about its other, highly beneficial uses. Here is a list of 8 ways that Epsom salt is actually one of the most useful items to have in the pantry. The difference between Epsom salt and table salt--the difference that makes the former a pseudo-magical ingredient--is in the composition. 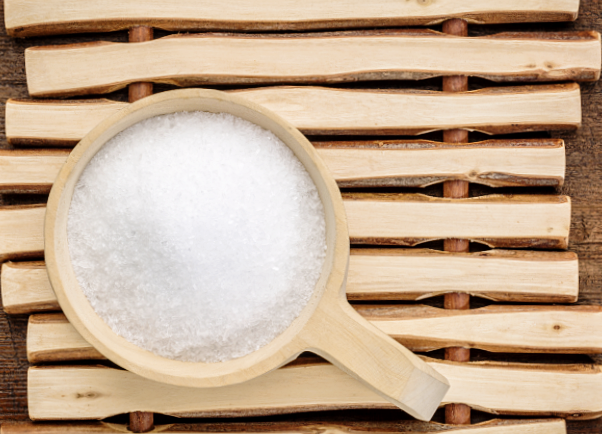 Epsom salt is made up of magnesium and sulfate, the key factor being the magnesium. Quite literally, Epsom salt is magnesium salt. Magnesium is quite possibly one of the most important minerals to our survival, though it goes mostly unnoticed even in the healthiest of circles. The following list will help you learn about the amazing ways that Epsom salt, aka magnesium salt, can make your mind, body, and spirit function a little bit better. This earthy mineral can heal many ailments and boost our organs to work more efficiently and painlessly. There are thousands of magnesium binding sites on human proteins, making it an integral part of basic cellular functioning. Since our proteins use magnesium in many of our basic functions, we can clearly notice the trickle down effect that magnesium has in our bodies. The magnesium sulfate combination in Epsom salt prompts a powerful detoxifying reverse osmosis when you soak in an Epsom salt bath. The salt draws toxins out of your body and then replenishes your cells with magnesium. In a world where the very air we breathe is filled with toxins, an Epsom salt soak is a great way to detoxify. The magnesium sulfate combination strikes again, this time collecting oils that it contacts. By sprinkling some Epsom salt in your conditioner--or better yet, mixing with a ripe avocado--and making a mask for your hair, you can lift a lot of grime and grease from your strands. This will leave you with volumized hair that is gorgeous and cheap (in a good way). Most people think that calcium is the key ingredient for healthy bones but they are mistaken: magnesium is essential for good bone health. Low magnesium has harmful effects on bone health and can lead to osteoporosis. Researchers recommend healthy levels of magnesium in order to prevent the disease. One study from the University of North Carolina found that magnesium deficiency significantly enhanced stress reactions. More studies have gone on to support this by finding that magnesium deficiency prompts neural excitability in response to stressors. So, if you’re magnesium deficient and stressed you might find yourself on a literal short circuit. A healthy dose of magnesium will not only relax your muscles but will also calm your stress response system in your brain. Epsom salt is a natural FDA-approved laxative that you can safely use at home. The magnesium in the salt relaxes muscles, including those of your bowels, so that waste can flow more easily through your intestines. For more serious constipation some professionals recommend consuming Epsom salt orally. The magnesium works in a similar way as in an Epsom salt bath, but with stronger and more immediate effects. *Always consult your health care professional before consuming! It’s no surprise that many people seek a hot Epsom bath after rigorous physical activity. Epsom salt is most recognized for its anti-inflammatory properties because its high-level of magnesium helps counter a deficiency linked to a higher C-reactive protein, a clear marker of inflammation throughout the body. This doesn’t just apply to sore muscles, though. Inflammation can take on many forms such as arthritis, bronchial issues, and even diabetes. Studies have shown that people low in magnesium are also higher in insulin. A study published this year showed patients who had a high intake of magnesium also had improved insulin sensitivity, increasing their ability to stabilize blood sugar. The research has been so significant, in fact, that many are starting to look to magnesium as a prevention and treatment strategy for diabetes. Accompanying Tea: Jasmine Tea (for de-stressing) or Moringa Tea (for detoxing). Mix the Epsom and Himalayan salts in a jar and cover with boiling water. Stir until dissolved. Fill your bathtub with hot water and add the apple cider vinegar and essential oils. Add the salt mixture and stir the water well. Soak in the bathtub for 20 to 30 minutes. Marquis Matson, TEEMA Tea staff writer and freelance blogger, is passionate about food, hiking and Latin America. She currently resides in Ecuador, where she lives as a writer and explorer, after a year long backpacking trip through Central America. Stand with us for #change. We'll make sure you know about new products, exclusive offers, and more.